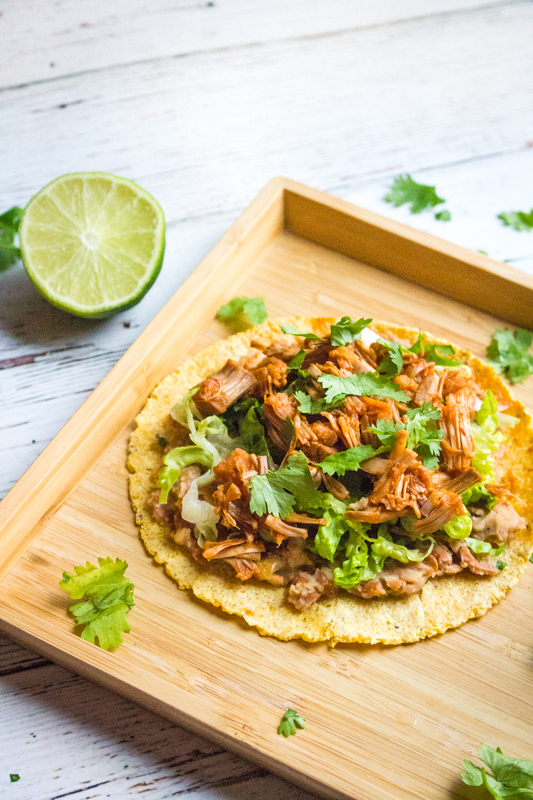 Jackfruit Tostadas | Vegan Mexican Night! 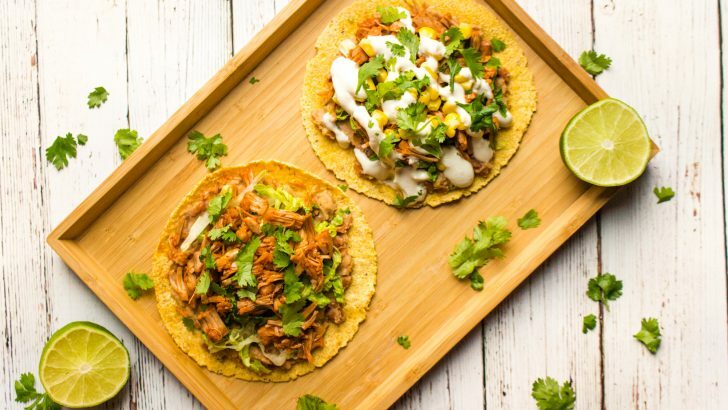 If you are a Mexican food lover like me, you’ll adore these Jackfruit Tostadas. I think most people get caught up in the same old routine with Mexican food. Sure, burritos and tacos are great, but there is so much more to Mexican cuisine! What The Heck Is A Tostada? A tostada is basically an open-faced taco on a crunchy shell. Tostadas are traditionally topped with beans, meat, and veggies, but they can oh-so-easily be made vegan! 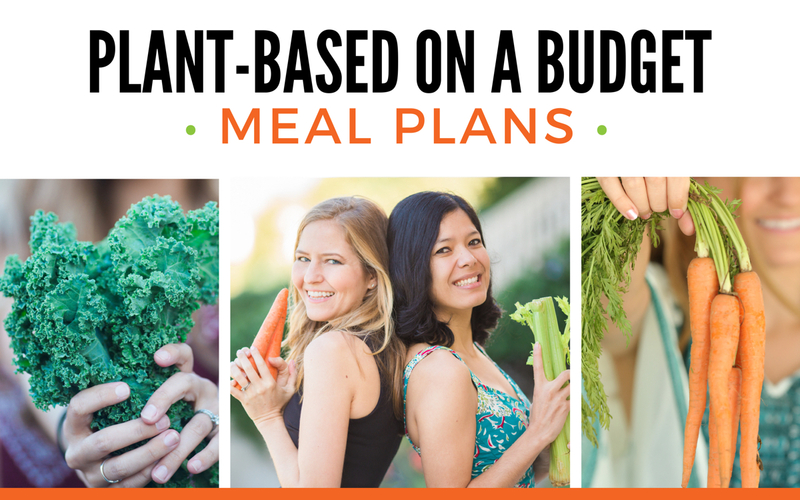 Of course, you can simply swap in vegan ground meat from companies like Gardein and Beyond Meat, but today we’re doing something extra-special. 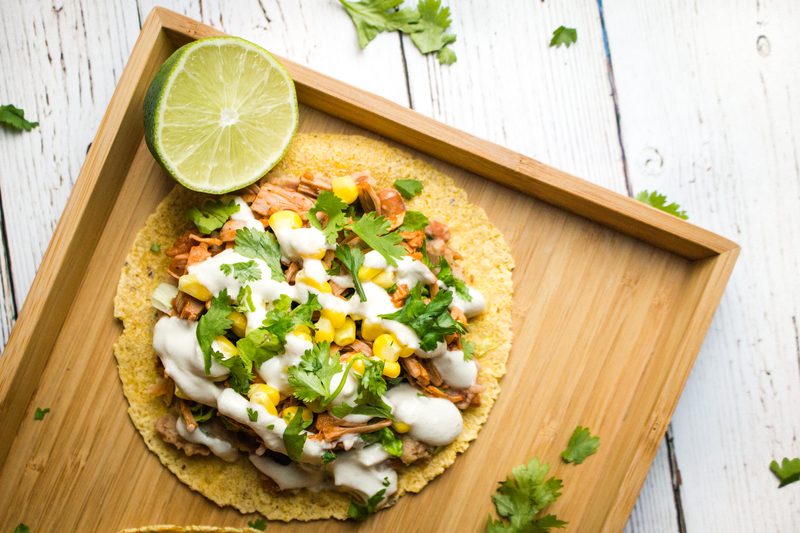 We’re using jackfruit as a plant-based take on a “pulled pork” tostada. I know what you’re thinking. “Fruit…in my tostadas? Eww, no thank you!” But wait. Give this recipe a chance and I promise it’ll win you over. Okay, Now What The Heck Is Jackfruit? Jackfruit is a pretty insane fruit. First of all, it’s HUGE. We’re talkin’ the size of a small child. A giant chipotle burrito x10. It’s actually the single biggest tree fruit on planet earth. The jackfruit you’ll find in stores might weigh around 10-20 pounds (still huge). But some jackfruit can grow to be upwards up 3 feet in length and weigh in at 100 pounds. Insanity! How Do I Eat This Crazy Fruit? They’re green and spiny oversized dinosaur egg lookin’ things. When they’re ripe, you can dig right in and eat them raw as you would with any other fruit, and enjoy the unique fleshy mango-esque texture and sweet flavor. But…when they’re picked well before they’re ripe they can be cut up and packaged in brine to be used in savory dishes. You can find this jackfruit in brine in many mainstream supermarkets. As you may have already discovered, unripe canned jackfruit is a fantastic substitute for pulled pork. Unripe jackfruit is mostly flavorless on its own, and it absorbs flavor beautifully, so you can spice and season it any way you like. That’s what we’re doing today! In this recipe, the jackfruit is seasoned with barbecue sauce and pairs perfectly with refried beans and the Mexican-style toppings. Begin by making the refried beans. Heat a large pan. Add the coconut oil, onion, garlic, and jalapeno to the pan and saute for 5 minutes. Add the cumin, chili powder, salt, and pepper and saute for another 3 minutes. Place the beans in a shallow bowl and mash them with a potato masher. Mash them until they are mostly broken down, but leave some texture. Add the beans to the pan along with the water, cilantro, and lime juice. Cook for another 5 minutes on medium/low heat. Set aside and keep warm. Heat a medium pan. Shred the jackfruit by hand and remove any firm cores. Add the jackfruit to the pan and heat it for 5 minutes. Add the bbq sauce and cook for another 5 minutes. Taste and add more bbq sauce if needed. Set aside and keep warm. Prepare any toppings that you will be adding to the tostadas. Just before serving, set your oven to 350 degrees F. Place the tortillas flat directly on the oven rack. Bake for just a couple of minutes, until they are firm (but not too hard). Watch that they don't burn! 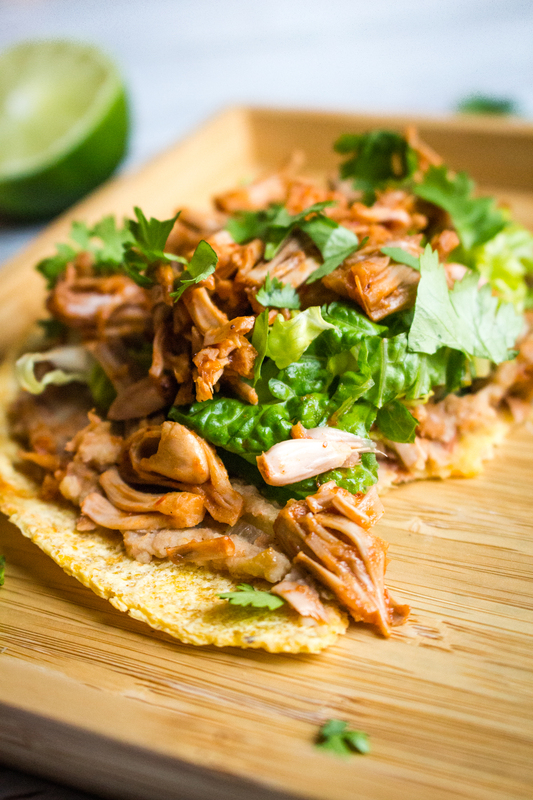 Assemble the tostadas by adding the refried beans, jackfruit, and any toppings you desire. Enjoy! You’ll first prepare the refried beans if you’re making them from scratch. But if you want to save time you can buy canned refried beans. Then prepare the jackfruit. Gather your toppings and then toast up your taco shells right before you’re ready to serve them. Assemble these bad boys and have yourself a fiesta! Get creative with the toppings. There are so many options! You can top these with chopped tomatoes, avocado (always! 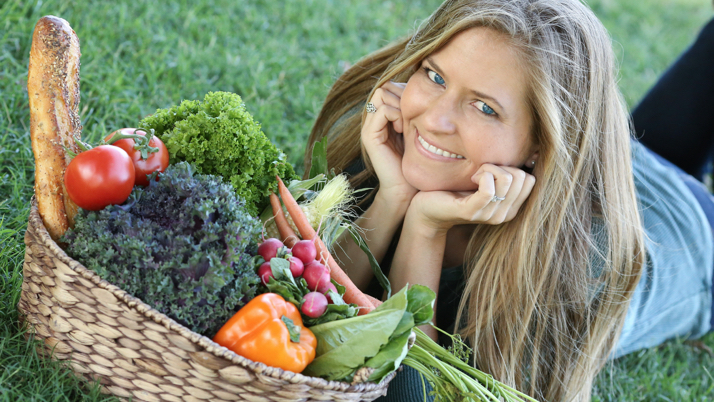 ), corn, shredded lettuce, salsa, guacamole, pico de gallo, red onions, jalapeno, cilantro, and more! You can even grab some vegan shredded cheese and vegan sour cream (like this one from the brand Tofutti). 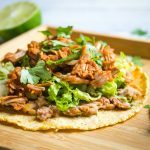 These jackfruit tostadas are an amazing recipe to serve for a casual dinner gathering with your family, friends or a potluck. You can make big batches of the refried beans and barbecue jackfruit “pulled pork” and then lay out all of the toppings and serve it buffet style. This recipe makes 6 tostadas, which will serve 3 people. Feel free to double or multiply the recipe if you want to serve more people! So…are you with us? 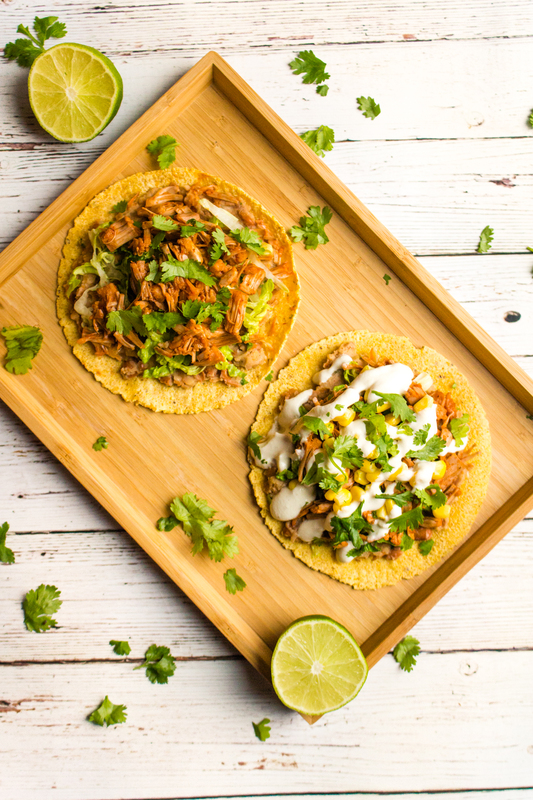 Switch up your usual Taco Tuesday or Mexican night and make these vegan jackfruit tostadas! More Vegan Mexican Recipes, Please! Hungry for more vegan Mexican recipes? Check out our recipes for Mexican red rice, Vegan Mollete, and cozy Mexican hot chocolate, or pick up a copy of this awesome Vegan Mexican Cookbook by Eddie Garza. 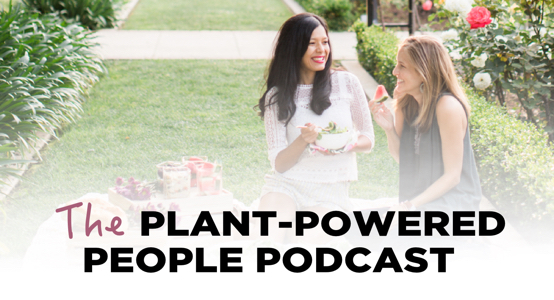 Hungry for more jackfruit recipes? Try this scrumptious jackfruit tuna salad. Jackfruit tostada photos by Kathy Chrzaszcz for World of Vegan. Recipe and photographs copyright of World of Vegan™, all rights reserved. 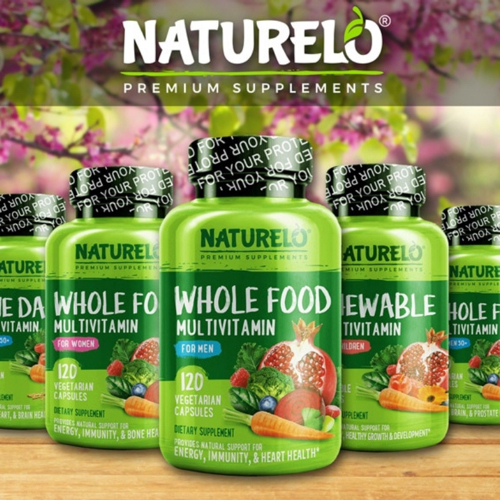 Please note that this article contains affiliate links which means shopping through them helps lights on at World of Vegan!